Game Seven. That’s all we really need to know as the 2015 PBA Commissioner’s Cup Finals winds up on Wednesday, April 29, 2015. 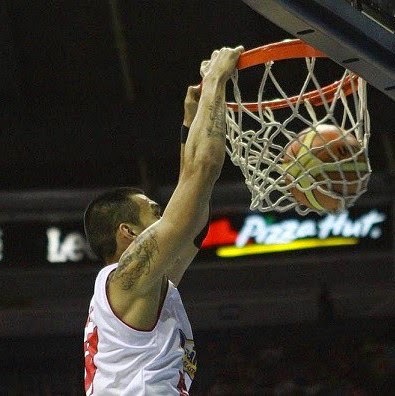 Rock N Roll Raymond Almazan slams one home as ROS beat TNT to force a winner-take-all Game 7! The Rain or Shine Elasto Painters were far from ready to go home, and they proved it with a tough stand in Game Six for a 101-93 win over Talk ‘N Text on Sunday that forced a do-or-die game for the PBA Commissioner’s Cup championship. The Elasto Painters led by as many as 16 points in the first half, but a strong third quarter for Talk ‘N Text and some big three-pointers from Larry Fonacier in the fourth trimmed the lead down to just four inside the final minute. Import Wayne Chism, though, knocked down four free throws and got a key defensive stop in the dying seconds to seal the win for the Elasto Painters. Chism finished with 18 points and 24 rebounds, while Raymond Almazan also had a double-double with 18 points and 10 rebounds. Paul Lee, who was the recipient of several hard fouls in the game, finished with 16 points and a team-high 5 assists. The Elasto Painters were able to hold down Talk ‘N Text import Ivan Johnson, who was never able to get into a rhythm after struggling with foul trouble, to just 6 points and 6 rebounds in 32 minutes of play. Rain or Shine led, 54-42, at the halftime break thanks to a balanced scoring attack that saw Almazan and Lee score 11 apiece in the first half and three other Elasto Painters contributing seven or more points. But Ranidel De Ocampo, who finished with a game-high 21 points, scored 11 points in a third quarter uprising for Talk ‘N Text. They outscored Rain or Shine, 29-22, and cut their double-digit deficit down to just five, 76-71, in the third. Chism, though, took care of two crucial fourth quarter free throws before jumping into the passing lane to intercept a dish intended for Jay Washington and sealed the win with two more from the charity stripe. Rain or Shine and Talk ‘N Text will play Game Seven on Wednesday. According to PBA head of statistics Fidel Mangonon III, it will be the 24th Game Seven in PBA finals history. Line of the Game: Wayne Chism (ROS) - 18pts, 24rebs, 2asts, 2blks, 1stl.